There is so much hype surrounding Mississippi rookie wide receiver D.K. Metcalf. Initially, he was in the consensus top 5, that is, until he posted a photo on social media showing off his chiseled upper body along with teammate A.J. Brown. Once that went viral, along with his supposed 1.6-percent body fat percentage, his stock rose even more. 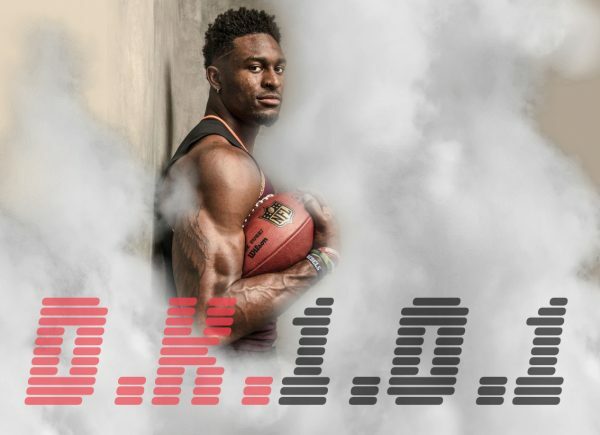 He was then considered in the top two, along with Arizona State’s N’Keal Harry and the football world was excited to see him fill out his advanced stats, metrics, and analytics player profile at the 2019 NFL Combine. Everyone knew Metcalf was going to excel but weren’t ready for his incredible 4.33 second 40-Yard Dash. It was tied for second among all receivers. What made his feat so impressive is he was able to do this with a 6-3, 228-pound frame. When converted to a Speed Score, Mr. Metcalf is in the 99th percentile. But that was not all. He crushed the Broad Jump and killed the Vertical jump, giving him a Burst Score in the 97th percentile. He’s strong, fast, and quick. He’s an athletic freak. He’s a beast. However, one thing he is not is agile. His Three-Cone and 20-Yard Shuttle were so bad that his 11.88 Agility Score places him in the 4th-percentile. Out of the 27 wide receiver rookies to participate in the agility drills, only Jaylen Smith was worse. Even Tom Brady is more agile than Metcalf. So what’s the deal with D.K. Metcalf? Will he succeed despite his polarizing athletic profile? What makes D.K. Metcalf so intriguing is his size. Compared to the wide receiver mean, he’s tall, big, has a towering wingspan, tree trunks for arms and has better than average hand size. Athletically, he is also impressive. He is überfast and is explosive. He is also strong, having almost doubled the average wide receiver’s bench press. This might help him catch passes but helps him with his blocking, an element that will give him more offensive snaps. Everything checks out for Metcalf except for his 3-Cone and 20-Yard Shuttle drills. This means that he lacks agility and short area quickness. 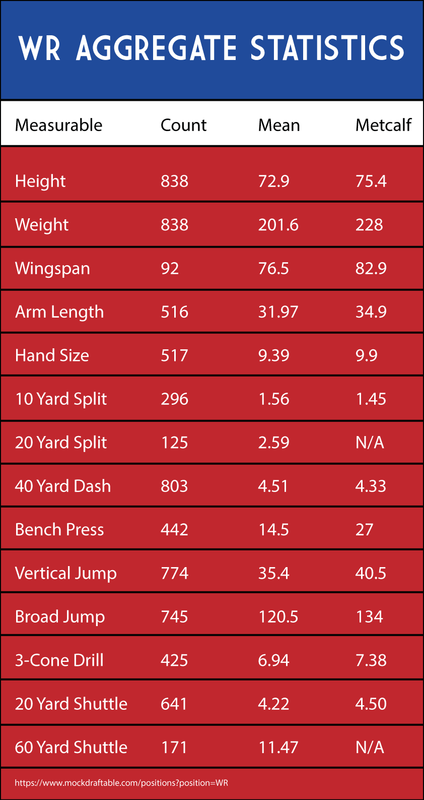 Although good agility helps a wide receiver separate while running routes, Metcalf has shown this ability despite his poor combine results in the agility drills. That being said, his route tree was limited in college. Moreover, his results were so poor that it does cause concern, especially when we are talking about him as being a first-round draft consideration moving to a more dynamic league. Physically, Metcalf resembles Demaryius Thomas almost identically. In terms of production, Metcalf is sandwiched between Mike Evans and Julio Jones. 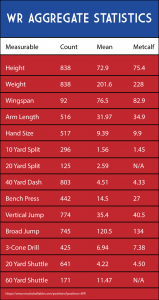 With regards to athleticism, Metcalf comes close to rivaling Calvin Johnson. The big difference is that while Metcalf’s Agility Score is devastatingly low, Johnson does not have one. Other players that have similar athletic profiles, yet less polarizing and impressive are Dez Bryant and Michael Floyd. There is a reason to be optimistic for Metcalf. Out of this group of eleven that he resembles in size, only Laquon Treadwell and Kelvin Benjamin lack overall athleticism. The jury’s still out on Treadwell, Benjamin, and Floyd to determine whether or not they are ultimately first round busts since all are young and remain in the league. Treadwell showed some life in 2018 but it would be surprising if he ever catches on fire. Although Benjamin and Floyd each have a season with over 1000 yards receiving, neither look to achieve that feat again. The only true bust of the group is Jon Baldwin. Bowe and Bryant had decent careers but never lived up to their potential. Both have three 1000+ seasons on their resumes. While Bowe is out of the league, Bryant still has a slight chance to achieve more but we are not counting on it, as he needs to rebound from a torn ACL at the age of 30. Anything thing is possible but he has an uphill battle towards showing dominance again. This group does have five success stories out of the eleven players that compare to Metcalf. It is important to note that four out of the five were drafted in the single digits of the first round. 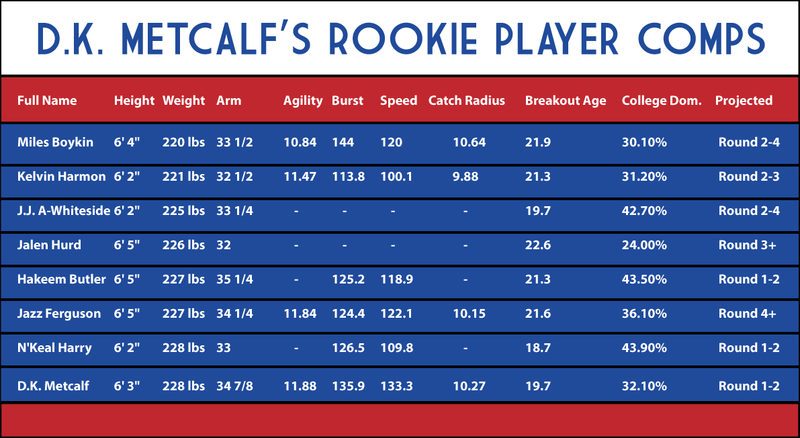 Although only five out of eleven players have lived up to their first-round hype, this bodes well for Metcalf. Knowing that he has an almost 50-percent chance to become an elite receiver is pretty incredible. As a reference, for example, the percentage for any receiver to become elite with a 90-percentile Speed Score, Burst Score or Agility Score is less than 10-percent based on historical data. Although Metcalf’s 32.1-percent College Dominator is above average (58th-percentile), what is most concerning is the fact that he only has 67 receptions to his name. That’s the second-fewest among all wide receivers drafted in the first round. Only first-round bust Cordarrelle Patterson (43) had fewer. Ahead of Metcalf is Kelvin Benjamin with 84 and he’s on his way of becoming a bust. Metcalf may dominate with the ball in his hands but he hasn’t had many opportunities to dominate. His resume is thin with many counting on his athleticism to carry him to great heights. He may have great potential but there’s also the chance he might not be very good. Many are enamored with Metcalf’s frame and speed but production is something to really consider when choosing between him and N’Keal Harry, who had 223 receptions at Arizona State. Metcalf may have the talent but it is raw and needs work. 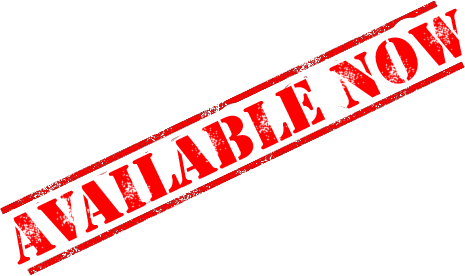 So many organizations do not have the patience to give a receiver enough time to develop. This is the case with guys like Dorial Green-Beckham who lasted two years in the NFL. Even he had 87 receptions in college. Most definitely. Again, based on a limited amount of players that are comparable to Metcalf, he has a 45% chance of becoming elite. However, Dwayne Bowe and Dez Bryant had productive careers despite not being elite for a long period of their careers. Therefore, seven out of eleven were good to great players, which brings Metcalf’s chances of at least being decent to 64%. Draft capital is important. 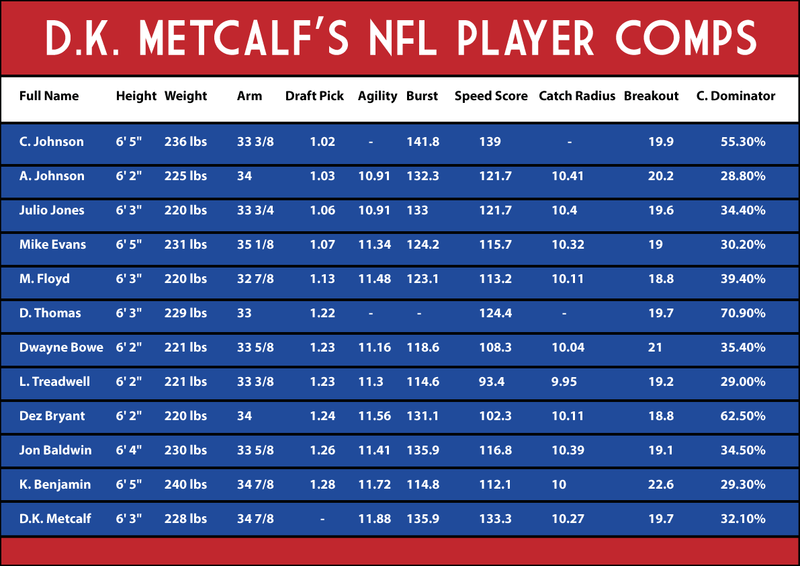 There are only 21 more wide receivers that have been drafted in the NFL that resemble Metcalf’s body size. We can discern a few things from this. One, Metcalf’s mammoth build is very rare. Two, those like Metcalf often go in the first round. Those who went in rounds 2-7 were less successful in the pro level. More were busts like Dorial Green-Beckham and Greg Little. Few still have the chance to be regarded as stars. The only receiver that is still active today that has a season over 1000 yards is Allen Robinson (2nd-round). The only superstars to come out of this group are Vincent Jackson (2nd-round), Brandon Marshall (4th-round) and Marques Colston (7th-round). Even if Allen Robinson turns out to be elite, only four players out of 21 would be considered successful, which is only 19%. 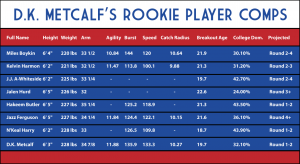 If Metcalf is drafted in the first round of the NFL Rookie Draft, his chances of success increases compared than if he gets drafted in the 2nd-round. Word on the street is that he is a first-round lock, which is good news for Metcalf. Apart from Jalen Hurd and Jazz Ferguson, the other five have a great chance to be drafted in the first two days of the NFL draft. Hurd has yet to test, and if he has a mind-blowing Pro Day, he can also be included in the conversation. Ferguson, who went to North Western State, a lesser-known school, is a long-shot despite his decent athletic profile, resembling Metcalf’s. The other two favorites to go early are N’Keal Harry and Hakeem Butler. Both opted to not do the agility tests. In hindsight, Metcalf should have probably skipped those drills as well. Many see Harry and Butler as safer options due to their better College Dominators, especially Harry, who has two productive seasons on his resume. The other wide receiver that is potentially ahead of Metcalf is his teammate A.J. Brown who is not in the table, not on account of his weight but because he is only six-feet tall. He has a similar College Dominator to Metcalf but has been a lot more productive at the college level compared to his injury-laden compadre. 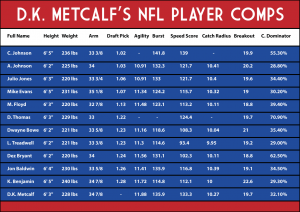 Assuming Metcalf gets drafted in the first-round, his chance for success is high. The probability for reaching Calvin Johnson dominance might be less than 50-percent but increases if we temper our expectations. However, his anemic college production compared to N’Keal Harry and Hakeem Butler, as well as his injury history, should be a major cause of concern. If you want to take a chance in your dynasty rookie draft, taking someone in the third-round onwards might be a better approach. Metcalf might have the highest upside in the 2019 wide receiver class but there is a possibility that this athletic phenome might turn out to be a colossal bust.